^ Largest Desert in the World. [2011-12-30]. ^ "Sahara." Online Etymology Dictionary. Douglas Harper, Historian. Retrieved June 25, 2007. ^ English-Arabic online dictionary. Online.ectaco.co.uk. 2006-12-28 [2010-06-12]. ^ Wehr, Hans. A Dictionary of Modern Written Arabic (Arabic-English) 4th. Wiesbaden: Otto Harrassowitz. 1994: 589. ISBN 0-87950-003-4. ^ al-Ba‘labakkī, Rūḥī. al-Mawrid: Qāmūs ‘Arabī-Inklīzī 16th. Beirut: Dār al-‘Ilm lil-Malāyīn. 2002: 689 （阿拉伯语）. ^ National Geographic News, 2006-06-17. 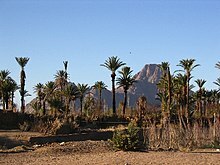 ^ Sahara's Abrupt Desertification Started by Changes in Earth's Orbit, Accelerated by Atmospheric and Vegetation Feedbacks. ^ Sahara desert. 陸地生態區. 世界野生動物基金會. [December 30, 2007]. ^ Walton, K. The Arid Zones. Aldine. 2007. ASIN B008MR69VM.